This is my mental health story. I think you should share yours, too. Three years ago, on Bell Let’s Talk Day, I shared my mental health story with my Facebook friends for the first time. Today, I’m sharing it with you. Ever since high school, I knew something was off, but I continued living like nothing was wrong. I was in my second year studying history at Trent University in Peterborough, Ont., when I started having suicidal thoughts. I was sleeping for just two hours a night, and knew I needed to see a counsellor. Once I got help, I was diagnosed with bipolar II disorder, a form of mental illness where my moods go from high to low and back again. A lot changed after I was diagnosed. I was put on medication and having a difficult time adjusting to my dosages and managing my mental illness. On top of that, when I opened up to my roommate, he became afraid of me, scared that I would become violent. I felt completely defeated and ended up in the hospital for a week. When I got out, I was a mess. I dropped out of school, and spent the next year living day-by-day, making sure my basic needs were being met and seeing a private counsellor. Counselling was hard. I hated it, and I hated the vulnerability that came with digging into the deepest parts of my psyche. It was painful work. My counsellor used to say, stop shoving your demons in a closet and just live with them. There’s no magic. It takes a long time and it’s not easy. A lot of people will go to counselling once, not like it, and never go back, but that’s not good enough. I liken counselling to going to a mechanic without your car. They know what can help you, but you need to do the work. Starting out, there were times I wasn’t allowed to leave the counsellor’s office until my dad came to pick me up. At first, I was desperately searching for a quick fix, but that doesn’t exist. Searching only made me feel worse. Over time, I’ve learned that it’s a slow climb back to neutral. After a year of counselling, I felt ready to go back to school. I went to Fleming College in Lindsay, Ont., where I completed their forestry technician program. When I graduated two years later, I decided to go to the University of New Brunswick to study forestry. Moving out east was a huge transition. 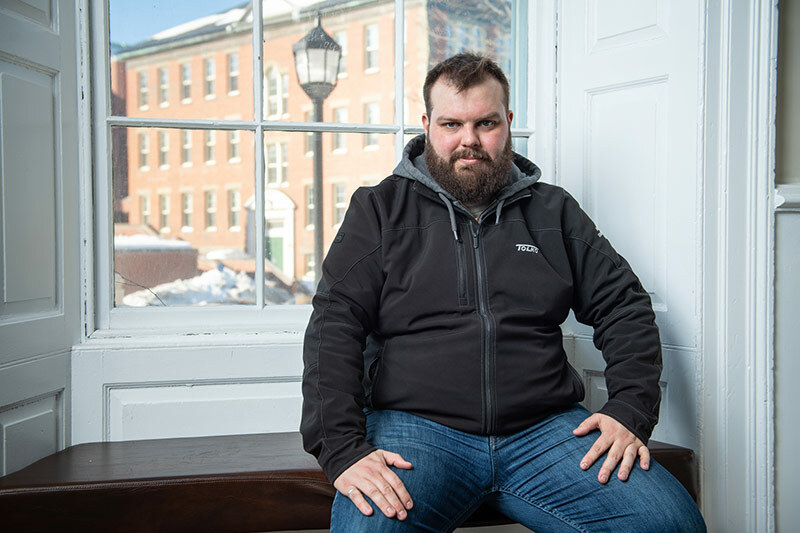 When I arrived in Fredericton three years ago, I had to rebuild my support network from scratch. I didn’t know anybody, and everything was new to me. There was a whole new set of expectations as well: do well in school, participate in extra-curriculars and make new friends, but my mental health took priority over all of that. Now, I attend regularly scheduled appointments at Counselling Services and, for the most part, keep my bad days to myself and talk to my counsellor about my struggles. When I’m having a bad day, instead of looking for a cure, I reach into my toolbox and dig out the coping skills I’ve learned over the past seven years. I know now that there are days when I’m not going to feel good. I know not to wonder why I’m feeling low. There’s no reason for it, and there’s nothing I can do about it but celebrate the little accomplishments, like getting out of bed or making it to class. I try and get plenty of sleep, eat well and go to the gym. For me, routine and stability are paramount. It’s also important for me to recognize when I’m at my limit, and not taking too much on. If I have to drop a course, I do. If I fail a test, that’s fine, too. Success doesn’t hinge on a 4.0 GPA, or finishing a degree in four years. I want people to know that it’s normal to struggle. That what I’m going through isn’t so different from what other people experience. I want the people who read this and feel similar to me to know that they’re not alone. But most importantly, I want to work towards the normalization of mental illness by talking about it as much as possible. That’s why I first opened up about my mental illness a few years ago on Bell Let’s Talk Day. Opening up about my mental health for the first time was terrifying, but I received a lot of support. Over the years, people have shared their stories with me, and some even ask for advice, to which my answer has always been the same: use the resources available to you. Go to counselling. If you’re a student, it’s free. If you hate it, go back. Just keep going. Eventually, it will help. If you’re struggling with mental illness, you don’t have to tell the world. I didn’t until a few years ago. But if you do, you might just hear from someone who has a similar story. After seven years, two universities, one college, and a handful of failed (but many more passed) courses later, I’m set to graduate from UNB’s faculty of forestry and environmental management in May. Though I may have taken a different route than many of my peers, I’m pursuing my dreams as they are theirs. I have a job as a tree checker lined up in British Columbia, and while a whole new set of changes are coming my way, I feel confident that with the right support, I can get myself through the hard times. I’ve shared my mental health story in hopes that you too will share yours. In hopes that we never stop talking. Kyle Brookes is a student at the University of New Brunswick. He will graduate from the faculty of forestry and environmental management in May 2019. For students, faculty and staff struggling with mental health issues, the following resources are available at UNB: Counselling Services, the Psychological Wellness Centre and the Office of Human Rights and Positive Environment. For those experiencing a mental health crisis please contact Mobile Crisis Services at 1-888-811-3664. Jan. 30 is Bell Let’s Talk Day. Bell will donate towards mental health initiatives in Canada by donating 5¢ for every applicable text, call, tweet, social media video view and use of their #BellLetsTalk hashtag, Facebook frame or Snapchat filter.